Predation is a fundamental ecological process that has profound effects on the morphology, distribution, abundance, and evolution of metazoans. 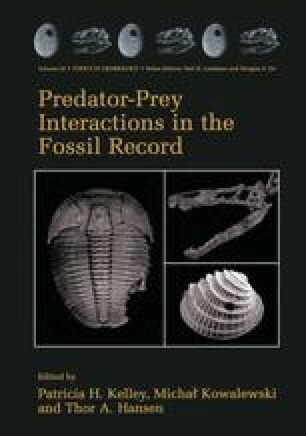 The earliest verified records of predation date to the Neoproterozoic-Cambrian transition interval (e.g., Conway Morris and Jenkins, 1985; Babcock, 1993a; Bengtson and Yue, 1992; Bengtson, 1994; Conway Morris and Bengtson, 1994; Nedin, 1999; Jago and Haines, in press), but the impact of predation almost certainly has a much deeper evolutionary history. Among the earliest and most widespread lines of evidence for the importance of predation in the early Paleozoic comes from the record of trilobites. As biomineralized animals, trilobites have left an excellent fossil record that extends from the latter part of the Early Cambrian (e.g., Zhang, 1987; Geyer, 1996, Geyer, 1998; Geyer and Palmer, 1995; Luo and Jiang, 1996; Hollingsworth, 1999; Geyer and Shergold, 2000; Peng and Babcock, 2000; Peng and Babcock, 2001), c. 520 Ma, to the end of the Permian (e.g., Brezinski, 1992), c. 248 Ma. Predation on and by trilobites evidently exerted influence on the morphological development of metazoans, as well as on ecosystem development, through the Paleozoic.